Get step-by-step instruction on learning how to wash your lingerie. Treat stains with Stain Solution or the Wash & Stain Bar. Focus on susceptible areas such as underwires, bands, and straps. The Wash & Stain Bar works the material to remove dirt, grease, oil, sunscreen, and makeup. To remove odors, presoak the item for 30 minutes in tepid water mixed with ¼ cup of Scented Vinegar. To whiten and brighten, pretreat with All-Purpose Bleach Alternative in a washbasin using hot water. Do not use All-Purpose Bleach Alternative on silk and wool. Handwashing is the best and safest method for washing bras. Add 2 capfuls or a squirt of Delicate Wash to a washbasin or sink filled with cool to warm water. Fasten the band closed and place it in a Mesh Washing Bag to preserve elasticity and prevent tearing and snagging in the machine. Select the delicate cycle and use cool water. 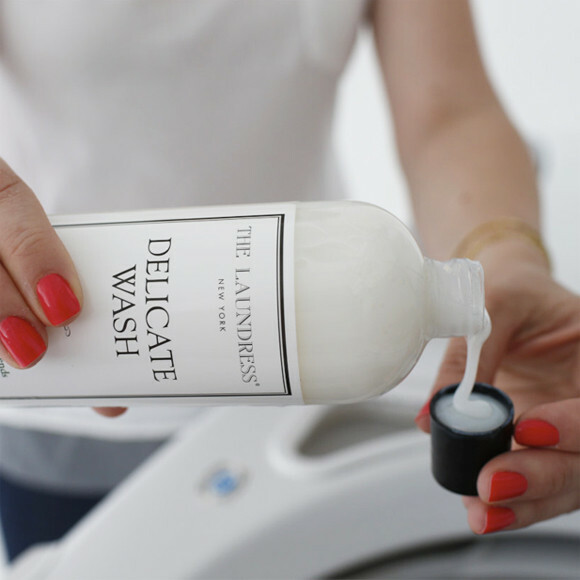 Add the appropriate amount of Delicate Wash according to the machine and load size. Always air-dry bras. The high heat of the dryer will reduce the fabric’s elasticity and moisture-wicking properties. Spritz with Delicate Spray to freshen and deodorize.